The Borden Avenue Bridge over Dutch Kills is located just south of the Long Island Expressway between 27th Street and Review Avenue in the Sunnyside section of Queens. Borden Avenue Bridge is a retractile type moveable bridge. The general appearance of the bridge remains the same as when it was first opened in 1908. The bridge structure carries a two-lane two-way vehicular roadway with sidewalks on either side. The roadway width is 10.5m and the sidewalks are 2.0 m. The west approach and east approach roadways, which are wider than the bridge roadway, are 15.3m and 13.0m respectively. The bridge provides a horizontal clearance of 14.9m and a vertical clearance in the closed position of 1.2m at MHW and 2.7m at MLW. 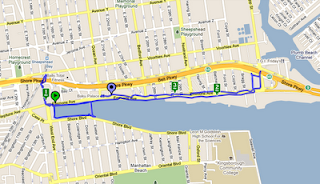 As part of the construction of Borden Avenue in 1868, a wooden bridge was built over Dutch Kills. This bridge was later replaced by an iron swing bridge, which was removed in 1906. The current bridge was opened on March 25, 1908 at a cost of $157,606. The deck's original design consisted of creosote-treated wood blocks, with two trolley tracks in the roadway. Character-defining features of this bridge include the stucco-clad operator's house, four pairs of rails, and a rock-faced stone retaining wall. The gable-on-hip roof of the operator's house retains the original clay tile at the upper part. Although alterations have been made, the bridge is a rare survivor of its type and retains sufficient period integrity to convey its historic design significance. 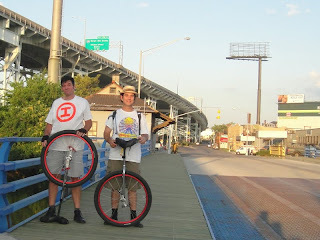 Sheepshead Bay — not exactly known for its wealth of bridges — but a cluster of happy unicyclists (yes, you read that correctly) are happily cycling their tuccheses around the borough on a single wheel, and recently made their way over what passes for “bridges” in our neck of the woods. 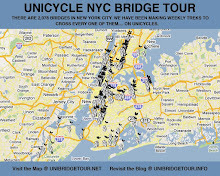 Stephanie Monseu, Keith Nelson, Rob Hickman, and Caleb Hickman, who operate the blog, “UNICYCLE NYC BRIDGE TOUR,” write that, “There are 2,078 bridges in New York City. 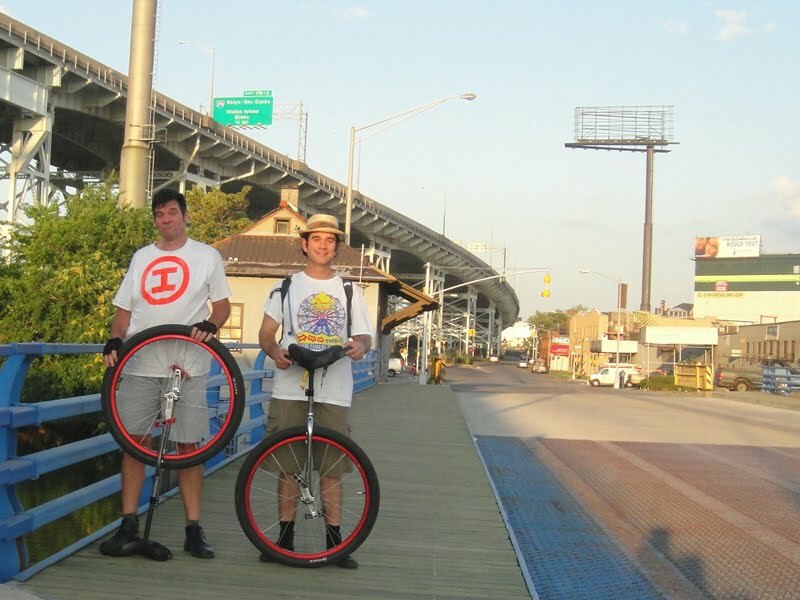 We have been making weekly treks to cross every one of them… on unicycles.” The unicycling quartet has thus far traveled over the Knapp Street overpass over Shore Parkway, the pedestrian overpass at East 14th Street over Shore Parkway, and the Ocean Avenue Footbridge at Emmons Avenue, just three of the 223 bridges that they’ve already crossed. They do need to be commended for their creativity. 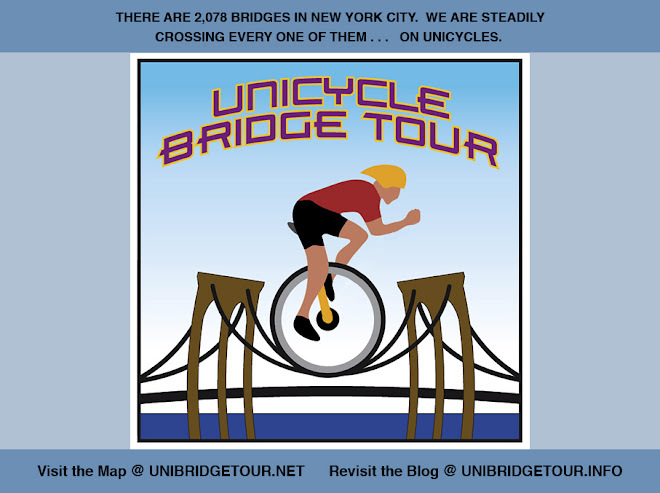 One can decide to take up unicycling, and one can set out to ride their bike over the city’s bridges, but it takes a truly special mind to combine the two and say, “Let’s unicycle over every bridge in New York City.” As the saying goes, everyone needs a hobby. First constructed in 1880, the footbridge over Sheepshead Bay is one of the rare bridges in New York that does not allow cars. 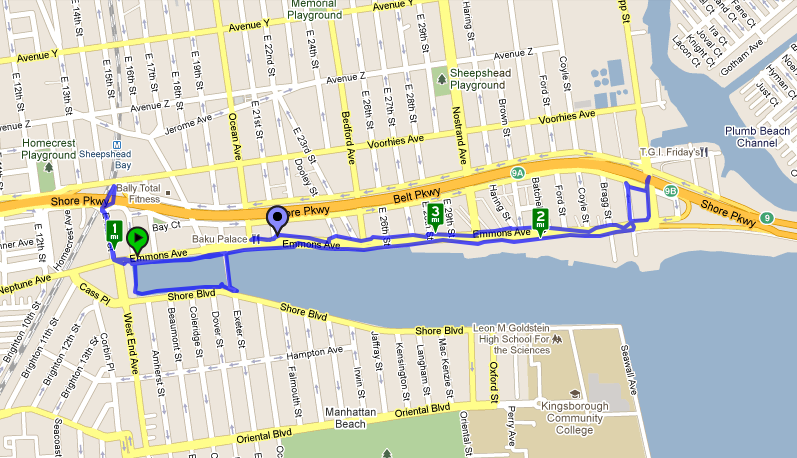 The current bridge, built in the 1930s, is both a well-trodden thoroughfare connecting the neighborhood of Sheepshead Bay with Manhattan Beach, and a destination in itself, a place to stop, linger, and fish. A recreational outlet for the middle-class residential neighborhood that exists there today, it is also a remnant of the days when the area was a well-known resort community. Austin Corbin, a railroad tycoon and banker, was responsible for the first Sheepshead Bay footbridge. "The Donald Trump of his time," according to Sheepshead Bay historian Brian Merlis, Corbin proposed a connection from his property on Manhattan Beach, where he operated the grand Manhattan Beach Hotel, to the mainland. Corbin's Manhattan Beach Company built a simple wooden drawbridge in 1880. At the time, Sheepshead Bay and the Atlantic barrier that contains Coney Island, Brighton Beach, and Manhattan Beach made up a district of pure recreation and amusement outside New York’s urban bounds. Corbin's Manhattan Beach Railroad connected the seaside resort to Manhattan with an hour's ride. The area was filled with resort hotels, including Corbin's sprawling, opulent Manhattan Beach Hotel, the equally grand Oriental Hotel, as well a host of smaller ones. The same year the Oriental and the first footbridge were built, the mainland neighborhood of Sheepshead Bay came to life with a racetrack, and gambling became an important pastime in the area. Corbin had proposed the bridge, but he changed his mind about it quickly. In 1879, he had begun to deny entry to his property to Jews, under pretenses of preserving what he characterized as an elite clientele. 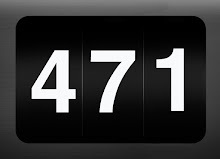 (New York changed its civil rights code in 1881 to make creed no more a basis for discrimination in public places than race.) After the bridge was built, Corbin found that it gave too-unrestricted access to Manhattan Beach, and sought to demolish it. But officials in the town of Gravesend (in what is now Sheepshead Bay) claimed that it was a public highway and had to be left intact. Corbin tore it down anyway. Others built it back, and a cycle of demolition and reconstruction ensued. In 1881, New York's Commission of Highways ruled that the bridge was a public highway, and the Supreme Court issued an injunction against tearing it down again. Once it was reconstructed for good, the bridge became an unquestionable landmark of the neighborhood.